This event will be held at Queens University, on April 13th, 2019. INNTD Charlotte Center City is offered in partnership with Nannypalooza and offered FREE of charge from Charlotte's Best Nanny Agency. We believe in offering this event FREE of charge to give back to nannies in the Carolinas. iNNTD was created and designed to recognize the needs of young children and to raise awareness of the positive correlation between educational training and improving quality care within our communities. This international incentive is a part of "The Week of the Young Child," an annual celebration sponsored by the National Association for the Education of Young Children (NAEYC).On Saturday, April 13th, nannies and educators all over the globe will gather to attend events designed to meet their unique needs. We have worked diligently to bring you an array of exciting workshops with topics given by local experts in their fields. 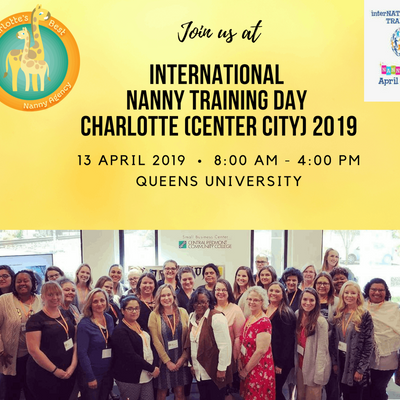 This affordable training is a wonderful opportunity to network with other nannies in your area and enhance your professional skills and knowledge.At INNTD Charlotte Center City's event we will have local professionals speaking on childcare and nanny related topics such as car seat safety, Better Brain Better Behaviors, Water Safety, Nutrition, developing a healthy relationship with your nanny family, and other related topics. We will also offer a breakfast, coffee and juice, as well as a awesome hot lunch. **If you have any allergies please alert Charlotte's Best Nanny Agency so we can plan ahead for your dietary needs. **The registrations will go very fast for this event and we will have a waiting list. So please only register if you know 110% that you will be able to attend INNTD Charlotte (Center City). If you register and discover that you can not go to this event please alert Charlotte's Best Nanny Agency immediately so we can release your spot to someone on the wait list. 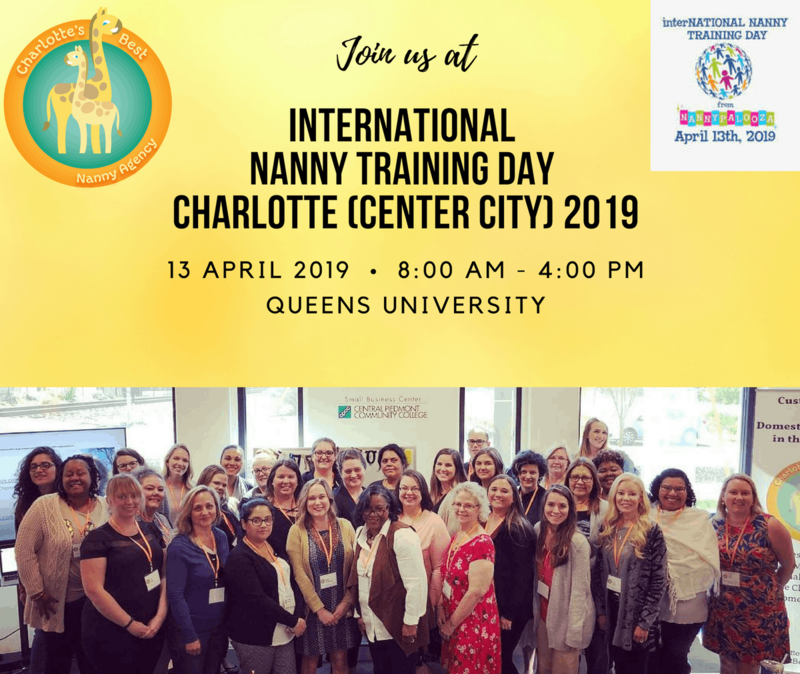 We are looking forward to seeing you all at International Nanny Training Day Charlotte Center City 2019. 1.) What day and time is the event held on? 2.) Where is the event Held? 3.) Where do I park? You are welcome to park across Selwyn Avenue at Withers House. park there and walk across Selwyn Avenue right into Skyes. Register at the welcome table inside the door, and take the stairs or elevator to the second floor and come to room 224. 4.) What should I wear? Something business casual including a dress or slacks and a blouse, top or nice shirt, and bring a sweater in case you get cold. 5.) What should I bring? You should bring yourself, a notebook or tablet, a water bottle if needed, and anything else you think you will need for the day. 6.) Do I have to stay for the whole event? Yes, you must stay for the whole event. This is a standard rule for INNTD Charlotte Center City 2019, so all speakers will get to be heard and the last speaker will have a full classroom. There are no exceptions to this rule. Remember to have fun and ask questions!